The weather here in southwest Ohio has gone from Winter to Summer in the course of seven days. There are an endless stream of Ohio weather jokes. As often is the case, it's funny because it's true. If you don't like the weather, wait ten minutes. It will change. While snow last weekend gradually worked it's way to 80 degrees today, I'm not one to let "comfortable" grilling weather pass me by. Yes, I'll grill in any type of weather, but it's always better in shorts. Some nights, especially after a long day of work, I know I want to grill dinner, but have absolutely no plans on what to grill. 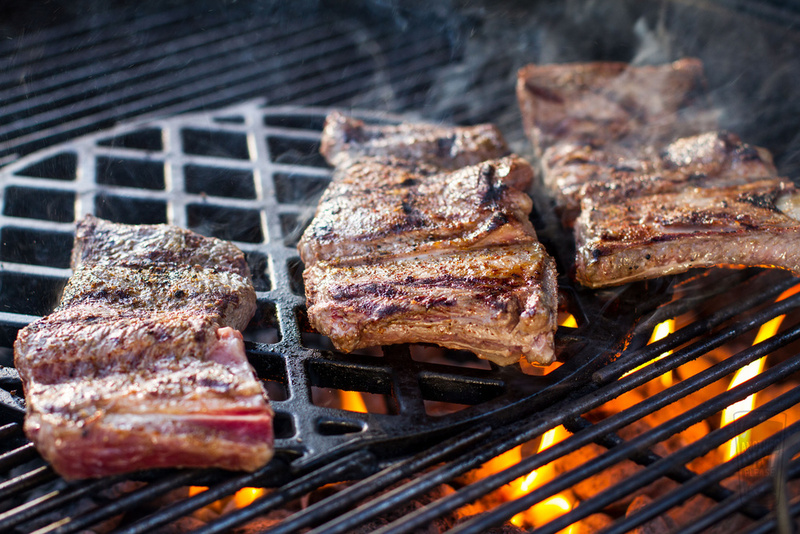 A steak, of any kind, is always an easy choice, but it's also an easy out. Enter the pork tenderloin. I happen to love pork tenderloin, but never seem to do a lot with them. There are, of course, a few exceptions. These pork tenderloin sliders are one. That said, while a well-rubbed tenderloin is good, an added addition of reduced peach preserves is better. The fact the preserves include Angry Orchard Cider elevates these even higher. 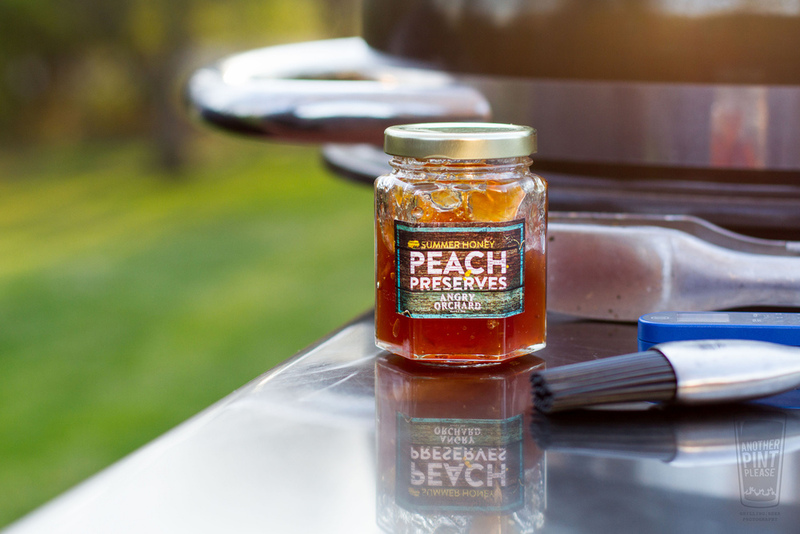 The preserves are perfect for a small cast iron pan on the grill. Once the tenderloin is marked over direct heat, about two minutes a side, baste the tenderloin with the preserves. The sweetness of the preserves is just enough to make a rather lean piece of meat something worth a second visit. With the Weber Summit Charcoal Grill finally in the wild, I've been able to slide my camera back and capture the grill's body in my shots. Not only is it great to grill on, it's just wonderful to look at and yes, for some time it has been the only grill uncovered. Take this one grill meal consisting of grilled filets (yes, of obviously different doneness), grilled potatoes, and planked & breaded walleye. Rounding out the week has also seen some wonderful planked salmon. My 7x15 cedar planks are my favorite because quite simply, they are huge. Whole salmon filet? No problem. Dill, lemon, and cedar makes for a classic flavor combination for dinner and leftovers mean Thai salmon cakes are not far behind. Don't forget the greens. Grilled romaine is still one of my favorites. I love short ribs. I'll take either flanken, or will cut down English cut, like here. A hot and fast cook to medium rare is key. Either wth a marinade or bold rub, these are meaty morsels great on their own or nestled down in a tortilla for tacos. These are really a great last minute dinner. I'm not sure why, but I've gone crazy for mangos. Not only in this killer fruit salad I've been devouring, but in my beer. Most notably, my favorite mango beer of the moment is Founder's Magnifico. It's a mango habanero blend and it's tantalizing. It starts with a heavy dose of sweet mangos from the nose to first taste and finishes with heat from the habaneros not showing themselves till the very, very end. The 10% ABV is about hidden and as the name suggests, it is precisely Magnifico. All I hope is this early warm weather continues, as I've got a lot more grilling to do. In shorts. Note: My work for Weber is compensated, but my views, commentary, and drink choices are all mine.